Bathtub Refinishing Do It Yourself? Is porcelain repair a viable alternative to fixture replacement? 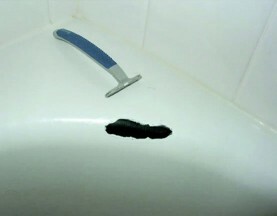 Porcelain bathtub surfaces can be successfully restored and repaired. Worn out, impossible to clean and chipped bathtubs can be returned to their original glossy finish by Miracle Method often in just one day. Whether you need to repair porcelain or refinish the entire porcelain bathtub surface, Miracle Method’s trained professionals can solve your bathtub resurfacing needs. 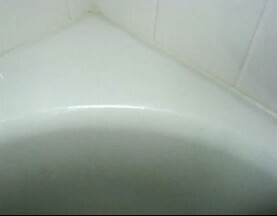 A porcelain tub repair of a chip or crack can often be completed in just a few hours. This chip repaired to like new condition! Porcelain repair requires expert craftsmanship as the area must be cleaned, filled, sanded to match the old surface and then bonded with Miracle Method's proprietary MM-4 to insure that the new surface will be durable and long lasting. The new finish is matched to the existing color and applied making the repair seamless with the old surface. Use of a porcelain repair kit is not recommended as it impossible to create a smooth new surface with brushes or rollers. Some DIY kits come with a porcelain etching primer, which can be very dangerous without the proper safety equipment and training. Each year Miracle Method offices use porcelain refinishing to restore bathtubs in which DIY bathtub or porcelain repair kits have been used.